Here is a way to acknowledge your history and have some fun with it as well. After the British discovery of Australia in 1770, they initially settled the colony of New South Whales by exiling criminals to the area. Although there were free colonies in Australia, it became known as Britain’s penal colony. 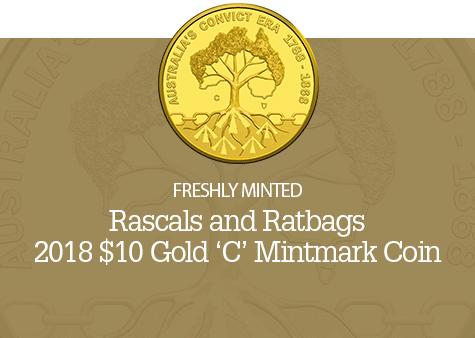 Rather than bemoan their sketchy past, especially since they have moved on to become a successful nation, the Royal Australian Mint seems to have embraced their history to have a little fun and promote coins. 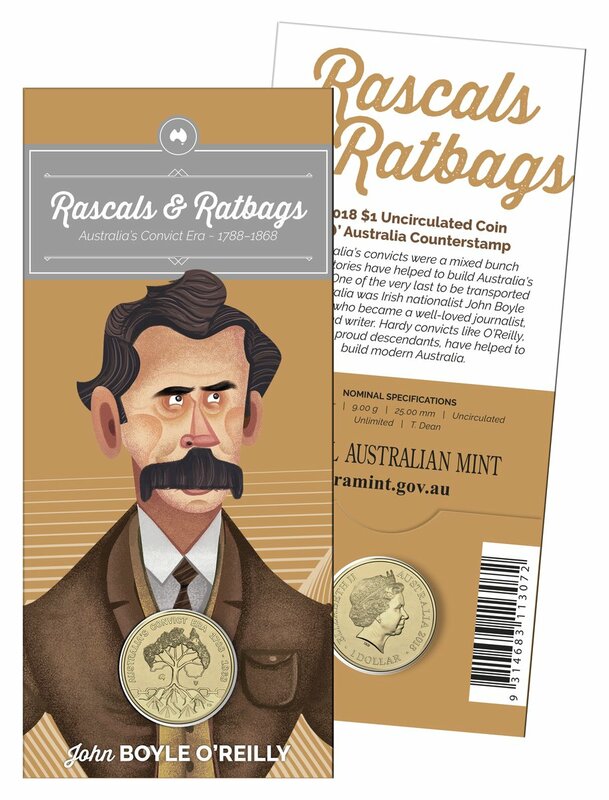 Using its yearly roadshow, the Royal Australian Mint kicked off its Rascals and Ratbags Roadshow Reveal at the Mint in the capital city of Canberra to introduced the Rascals and Ratbags coins. These coins celebrate the 230th Anniversary of the arrival of the First Fleet on the island nation and the 150th anniversary of the Hougoumont, the last ship to carry convicts to Australia. The coin is available in Australia as a four-coin uncirculated mintmark and privy mark set, a $1 (AUD) silver proof with the “C” (Canberra) mintmark, and a one-tenth ounce $10 (AUD) gold proof coin also with the “C” mintmark. Since these are not colored coins they will not be a subject of their lawsuit with the Royal Canadian Mint. As part of the celebration, the Royal Australian Mint is traveling with a portable press to allow visitors to strike a special Australia counterstamp in their coins. It goes to show that rather than dwell on your past problems, fix them and move on. Have a little fun at your own expense. It is certainly better than the arguing that pervades the United States. One of the more interesting news items is that the Royal Canadian Mint is suing the Royal Australian Mint. The Royal Canadian Mint alleges the Royal Australian Mint infringed on its patents when creating the 2012 Remembrance Day $2 coin. 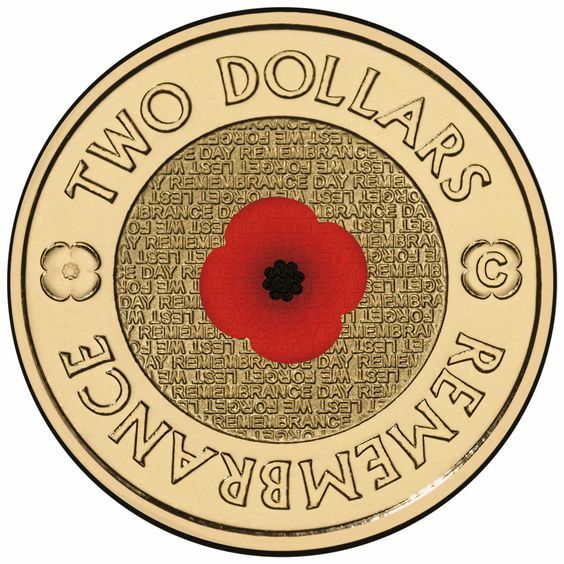 Apparently, the Royal Canadian Mint alleges that the process used by the Royal Australian Mint to produce the 2012 $2 Remembrance Day Poppy coin used a process that was patented by the Royal Canadian Mint. The Royal Australian Mint says the process is substantially different that it does not infringe on the Royal Canadian Mint’s intellectual property. Since the Royal Canadian Mint is a crown corporation, it is an independent entity of the Canadian government. It has its own corporate and governance structure mandated by law. For those in the United States, it is similar to the relationship that Fannie Mae and Freddy Mac have with the United States government. On the other hand, the Royal Australian Mint is an agency in the Australian government in the same manner that the U.S. Mint is an agency in the United States government. Therefore, the Royal Canadian Mint is suing the Commonwealth of Australia. “The applicant has suffered, and will continue to suffer, loss and damage by reason of the acts of the respondent pleaded above,” the statement of claim filed by the Royal Canadian Mint reads. Really? The Royal Canadian Mint has suffered because the Royal Australian Mint created a coin with a colored poppy for sale and distribution in Australia? If the Royal Australian Mint infringed on the Royal Canadian Mint patent then there may be a case for relief owed for using the technology. But if the Royal Canadian Mint is trying to make a case based on the suffering of damages from sales of circulating versus commemorative coins, I think that the Royal Canadian Mint may be royally going in the wrong direction. Image courtesy of the Royal Australian Mint and had to be downloaded from Internet archives since it was deleted from their website. Why do colored coins bother me? Whenever I comment on using design elements on coins that do not involve engraving I am reminded that one person’s gimmick is another’s innovation. I am also reminded that I have demonstrated a bit of hypocrisy by purchasing some of these coins for my collection including celebrating the innovation of one of these coins. So why do I have a near visceral reaction to the introduction of a coin whose purpose is to commemorate with a non-engraved design elements? The question came to mind after the Perth Mint introduced the “Charlie Chaplin – 100 Years of Laughter 2014 1oz Silver Proof Lenticular Coin.” The coin is issued by the Pacific island nation of Tuvalu to honor the 100th anniversary of Charlie Chapin’s first movie appearance as The Tramp. The ingot-shaped coin features the Ian Rank-Broadley designed portrait of Queen Elizabeth II on the obverse and an image of Chaplin on the reverse. The reverse does not use just any image. It is the iconic image of the waddling tramp walking away from the camera. Like the image on the screen, this is a moving image. Using lenticular technology, the image will shift as you move the coin making it appear that Chaplin is walking. Chaplin was the nascent movie industry’s first megastar. Although Mary Pickford and Douglas Fairbanks were the most recognizable of the time, Chaplin was the first actor whose movies were considered a success because he was involved with them. And while there were posters and booklets printed about other stars, Chaplin was the first to be fully merchandised around the world including a Chaplin doll that is one of the most prized toy and movie memorabilia collectibles today. Even though Chaplin was the phenomenon of this time and I consider myself a fan, I am having a difficult time liking this coin. In fact, I downright hate it! I cannot explain why I hate this coin because I am interested in the Niue 2007 Van Gogh silver coin and the Andorra 2008 Renoir 10 Diners silver coin. All three coins are colored coins and ingot shaped, but the Chaplin coin really bothers me. Although I did not like the Monnaie de Paris 2012 Yves Klein commemorative coin with the blue hand, I did not have this type of reaction. However, I still like the 2006 Canadian Breast Cancer commemorative and circulating quarter with enameled features. 2006 Breast Cancer Silver Coin with colored pink ribbon. One of the differences between the colored coins that I like versus those that I do not are the ones I like do have some engraving involved. And even though I do not like the Yves Klein commemorative, I do not find it as objectionable because the blue hand is an enhancement and not the entire design on the coin. Not counting the Somalia motorcycle and sports car coins, I seem to have this response where the coloring or design gimmick encompasses the entire design of the coin. Once the coloring or other design elements that are not engraved go beyond enhancements and are used to create the design is when I begin to object. It could also be the subject matter. As a resurgent gear-head with an eye toward the classics, the Somalia classic motorcycles and sports car coins appeal to me while the coins with colored birds and flowers do not. As the surviving spouse of a cancer victim, I supported the use of coins to raise money for cancer research by the Royal Canadian Mint, but none of the current hologram coins would interest me if they did not have the holograms. Color and other enhancements on coins are here to stay. If there were not a market for them then the various mints would not produce these types of coins. It may be something that will attract more collectors and grow the hobby, which is good. Maybe I should think about these enhancements like I think about cars: I want a car that drives and feels like a car and a coin that is engraved art; I do not want to drive a computer nor a coin that seems gimmicky. Image of the 2014 Charlie Chaplin 1-ounce lenticular silver coin courtesy of the Perth Mint. Images of the Van Gogh and Renoir coins courtesy of Talisman Coins. “In Flanders Fields” was written during World War I by Lieutenant Colonel John McCrae, a Canadian physician stationed in northern France. Aside from being a physician, he was a teacher, poet, and author. McCrea was appointed as a field surgeon and was in charge of a field hospital during the Second Battle of Ypres when his friend and former student Lieutenant Alexis Helmer was killed in the battle. The death and funeral of his friend inspired McCrae to write the poem. “In Flanders Fields” was published anonymously in the British magazine Punch on December 8, 1915. However, the index for the year printed only a few weeks later attributed the poem to McCrea. The poem became one of the most popular of the war and was extensively printed in the United States while its leaders were debated whether to join the war. McCrae died of pneumonia on January 28, 1918 while commanding No. 3 Canadian General Hospital (McGill) at Boulogne. He was buried with full military honors at Wimereaux Cemetery near the English Channel 3 miles from Boulogne. 2004 Canada Poppy Quarter, the first colorized coin ever issued for circulation by any mint. McCrae’s poem has made the poppy a popular and powerful symbol of Remembrance Day celebrated on the eleventh day of the eleventh month in the Commonwealth Realm to mark the anniversary of Armistice Day in 1919. In the United States, we celebrate it as Veterans Day. The remembrance poppy is not as strong a symbol in the United States since the nation did not declare war on Germany until April 1917. The American Legion has used the poppy as part of its fund raising efforts. Maybe the United States should embrace the poppy as well. Why not create a commemorative coin with a colored poppy as the design and use the seignorage from the sales to support the work of the Department of Veterans Affairs? How about changing the reverse of the Roosevelt Dime to be a red-colored poppy to raise awareness of all our veterans? Using the Roosevelt Dime would give it a needed refresh and would tie both World Wars in one coin. 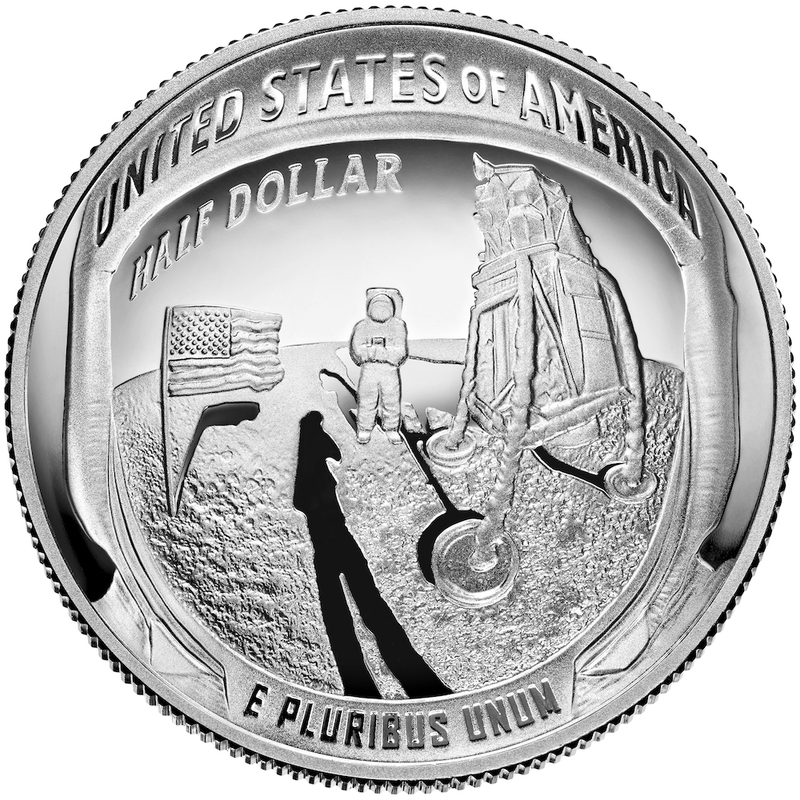 Then the U.S. Mint could strike special silver dime for sale to the public. Maybe it is an idea whose time has come. Last year I asked why the United States would not consider using polymer notes after the Bank of Canada made their announcement that they will transition to using the polymer substrate. Not only are polymer notes very difficult to counterfeit, they last longer reducing printing costs and overhead to both the Bureau of Engraving and Printing and the Federal Reserve. The Spink Auction was held on October 2, 2012 in their London offices. None of the nine Canadian test notes printed on DuraNote were sold. After it was announced that Spink of London will auction sheets of DuraNote trial printings from the Bank of Canada, BEP told CoinWorld that they printed as many as 40,000 sheets of Federal Reserve Notes using the DuraNote substrate. DuraNote was a product of Mobil Chemical and AGRA Vadeko of Canada. Trials of DuraNote were not successful and the project was abandoned. Patents for DuraNote were sold following the Exxon-Mobil merger. Around the same time, the Reserve Bank of Australia (RBA) developed a polymer substrate with a different formula that went into production in 1992. Since then, Australia has been successfully printing polymer notes. In the mean time, there continues to be issues with folding of the paper specially designed for the new $100 Federal Reserve Note. Since the October 1, 2010 announcement by the Fed of the folding issue, the Fed and BEP has less than forthcoming on the status of the new note including the BEP withholding their annual report for fiscal year 2011 so they do not have to disclose how many of these notes they have in inventory. The paper being used by the BEP is manufactured by Crane & Company who has had the exclusive contract with the BEP since 1879. Where DuraNote failed RBA succeeded in creating a workable technology that is being adopted world wide. With the new $100 note having printing problems, why has the BEP not looked into the RBA polymer substrate for U.S. currency? Why does the Federal Reserve, BEP, and Secret Service cling to 19th and 20th century printing technologies in the 21st century? Or is this a matter of the influence being purchased [PDF] by Crane & Company in order to maintain its monopoly. Maybe it is time for the Fed and the BEP to re-examine their commitment to paper and stop wasting time and money with failed technologies.